Fascinating stuff, Charlie. No. I was so wrapped up in the Solutrean boating technology that I forgot that they would have needed missile weapons to throw from those boats! And since standing up in a boat to get leverage for a throw is chancy archery makes a lot more sense. Maybe not for a whale....but certainly for a seal or something. I've got to read those articles in detail. Last edited by Charlie Hatchett on Fri Mar 06, 2009 7:22 pm, edited 1 time in total. That 'arrowhead' is a well made piece-one thing about it's size-it's meant to penetrate and smaller point will do that easier than a large one-all the while damaging vital organs thus weakening the prey. And again the Atlatl don't get no respect. I would never want to diss the atlatl, Sam, but that point just seems too small for a "spear" (of any kind) but it does match up nicely with arrow heads which have been dug up. But, of course, they did not have "archery" back then...any more than they had boats, so, how can this be? Min, I'm pretty sure that dart points were the smallest points (thrown by an atlatl). Most sources I've read put bow and arrow use in the Americas at around 400 AD. I don't know, guys.....why would they spend their time making these if not to use them. And why would they resort to thrusting spears on mammoths when they already had atlatl technology? Each of the few Clovis caches that have been found have some unique characteristics. The East Wenatchee Clovis site is famous for its extremely large Clovis points. Up until the discovery, known Clovis points were no where near the size of these points. The largest point in the Drake cache from Colorado is about 6 1/2 inches long and the longest in the Fenn (Utah) and Anzick (Montana) cache are about 6 inches long. Although there is one unfinished late stage preform Clovis point in the Fenn cache that is about 8 1/4 inches long. Five of the Wenatchee Clovis points are above 8 inches in length and at least two or three are 9 inches and above. 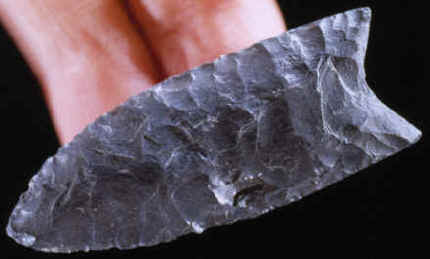 Number 1990.1 measures 9 1/8 inches long and is the largest of the fourteen Clovis points found. Another large Clovis point from the area called the "Rutz" Clovis (CLICK HERE) was brought to light when the owners read an article about the Wenatchee site in National Geographic magazine. This point was found several years earlier on a high plateau approximately ten miles from Wenatchee. It's made of rainbow Obsidian and measures 9 3/4 inches long making it the largest Clovis point known to date. Now, that said....it seems highly likely that they would employ different weapons for different targets. Why use a big heavy javelin to take down a rabbit when you could use a lighter spear in its place? Last edited by Charlie Hatchett on Fri Mar 06, 2009 7:23 pm, edited 5 times in total. Last edited by Charlie Hatchett on Fri Mar 06, 2009 7:24 pm, edited 3 times in total. They've just never been found in association with a kill. We've never found a boat either, Charlie, but they must have had them! A javelin is a light weight spear. I've thrown heavier spears with 9" steel heads - there is just no way you're going to throw them that far between the weight and the balance - and a rock spear point weighs much more than a refined steel spear head. A smaller head on the spear works very well - either by hand or atlatl. To kill a big animal you need penetration to a vital organ - a big spearhead would be hard pressed to do that. They use the larger spears for close up killing. It is now, Rich....but was it always so? The pilum (plural pila) was a heavy javelin commonly used by the Roman army in ancient times. It was generally about two meters long overall, consisting of an iron shank about 7 mm in diameter and 60 cm long with pyramidal head. The iron shank may be socketed or more usually widens to a flat tang, this was secured to a wooden shaft. A pilum usually weighed between two and five kilograms, with the versions produced during the Empire being a bit lighter. Pictorial evidence suggest that some versions of the weapon were weighted by a lead ball to increase penetrative power, but no archeological specimens have been found. Recent experiments have shown pila to have a range of 98 feet (approximately 30 m), although effective range of about half to two thirds. Legionaries of the Late Republic and Early Empire often carried two pila, with one sometimes being lighter than the other. Standard tactics called for a Roman soldier to throw his pilum (both if there was time) at the enemy just before charging to engage with his gladius. Some pila had small hand-guards, to protect the wielder if he intended to use it as a melee weapon, but it does not appear that this was common. While screwing around with this I came across one web site which suggested that clovis points were repeatedly re-sharpened and became smaller as a result until the reached the point where they could not be re-sharpened any further. Perhaps what is abandoned are the ones which are of no further use and the better points were taken for further work? I can't find that web site again, of course, but maybe a bit later I'll sort through my history folder and see if I can pick it out....or at least find the link that I used to get to it. Interesting stuff. I would think that the coup d'grace was given with a thrusting spear to the belly, throat, or carefully between the ribs because, as Charlie suggests, these points were far too valuable to risk breaking on a rib or something. But if you are going to get to the vital organs of a mammoth I think you need something sharp and long. In any case these people weren't afraid of the ASPCA. If they were hunting a large and dangerous animal I would think they'd aim for the back legs to cripple it rather than stand off at a distance trying to penetrate the rib cage. Once its down then you can move in close to finish the job. In any case, it seems reasonable to assume that they would have had a variety of weapons at hand to do the job. Last edited by Charlie Hatchett on Fri Mar 06, 2009 7:24 pm, edited 2 times in total. This is the largest Clovis point that was found during excavation of the Lange - Ferguson mammoth kill site. It was probably resharpened at least one or more times. This spear point is made of a black opaque chert and measures 2 1/8 (54 mm) inches long. Yeah, Charlie, I would think that these points were the single most valuable piece of equipment that these HGs had. It does make sense that they would "re-cycle" them for as long as they could and only reluctantly part with them. I also imagine that the shaping of points was the single biggest nightime activity amongst them.